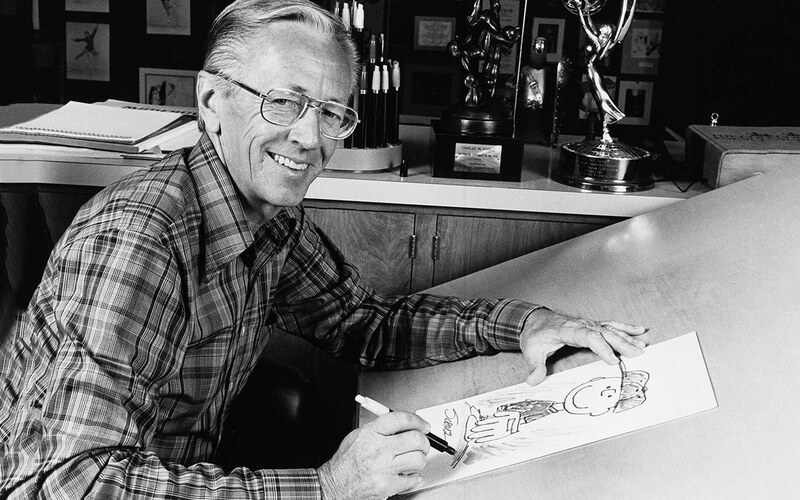 Charles Monroe Schulz (November 26, 1922 – February 12, 2000), nicknamed Sparky, was an American cartoonist, best known for the comic strip Peanuts (which featured the characters Snoopy and Charlie Brown, among others). He is widely regarded as one of the most influential cartoonists of all time, cited as a major influence by many later cartoonists. Calvin and Hobbes creator Bill Watterson wrote in 2007: “Peanuts pretty much defines the modern comic strip, so even now it’s hard to see it with fresh eyes. The clean, minimalist drawings, the sarcastic humor, the unflinching emotional honesty, the inner thoughts of a household pet, the serious treatment of children, the wild fantasies, the merchandising on an enormous scale—in countless ways, Schulz blazed the wide trail that most every cartoonist since has tried to follow. Found found memories of being a child and learning to read and reading Sunday morning Peanuts to my dad.